Lightning was reported in the Cramer Creek area at about 2100. 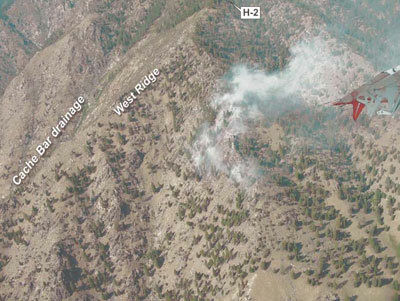 A single-tree strike ignited what was to become the Cramer Fire on a spur ridge running south of the West Ridge. The fire was not detected until the following afternoon. The Cramer Fire was reported at 1630 by Long Tom Lookout. It was burning on the upper portion of a steep, rocky westfacing slope. A smokejumper plane (jumper 41) diverted to the Cramer Fire estimated it to be about 3 acres (figure 15) with high spread potential. The fire was burning primarily in grass and light ponderosa pine needle litter (fuel models 1 and 2). Fuels were sparse and light, and the fire was spreading by creeping, backing, and rolling burning material (rollouts). By the end of the day, it had burned up to the top of the spur ridge (figure 16) and was spreading downhill by backing and rollouts. Figure 15—Cramer Fire from jumper 41 plane, July 20, 2003, at 1705. Figure 16—Cramer Fire perimeter and spread on July 20 later in the evening. At 1938, the fire was 20 to 25 acres. It was burning through grass and sagebrush on the lower portion of the fire, and in open timber in the upper portion. In the timber stands, the fire was reported to be burning actively but spreading slowly. A thermal belt had set up late in the evening in the area, and conditions on the fire remained warm and dry. The fire remained active through late night and early morning. At 0130, the temperature on the fire was 73 °F with little humidity recovery. Rollouts were frequent, and included large trees which were reported rolling from the top to the bottom of the slope. The fire began to die down about 0230 with increasing RH. Relative humidity recovery overnight was 63 and 66 percent at Indianola and Lodgepole RAWS, respectively. Fire activity was minimal in the morning, with only minor fire growth after 0300. At 1000, air attack estimated the fire size to be 40 acres. There was some fire activity on the northeast corner, but the western perimeter had burned into rocks and appeared cold. A spot weather forecast was requested at 0710 and received on the fire at 0800. 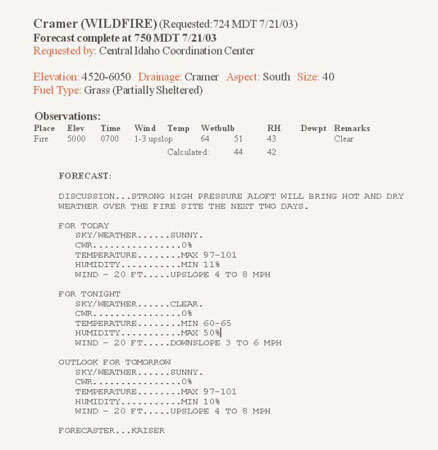 At 0800, fire personnel noted that winds the previous night were much stronger than they had expected, and the spot forecast for July 21 (figure 17) called for winds much lower than they were expecting. Figure 17—Spot weather forecast issued by the NWS Pocatello office for July 21. After 0900, the RH began to drop steadily. Fire activity began to pick up by 1130, with RH values dropping into the low 20s at midelevations and into the teens at lower elevations. Most of the fire activity was on the north and east sides, and picked up through the afternoon with increasing, shifting winds. Gusts 15 to 20 mph were reported on the fire. 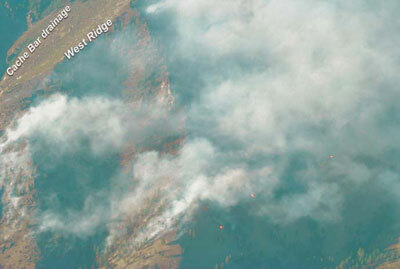 The fire was moving to the south and west and backing east down into the main Cramer Creek drainage. By 1715, air attack estimated the fire to be about 60 acres. RAWS observations indicate this time was nearing the peak of the burn period. In the next 21/2 hours, the fire burned actively with surface fire spread and rollouts, and isolated torching, and grew an additional 140 acres. 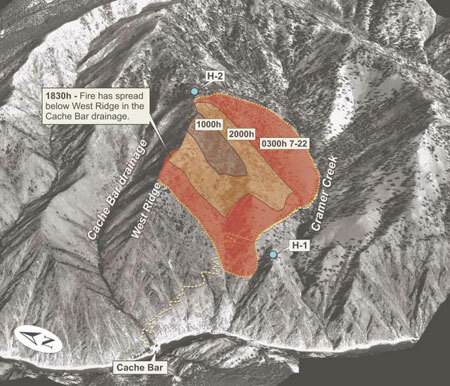 At 1830, the fire spread into the Cache Bar drainage. 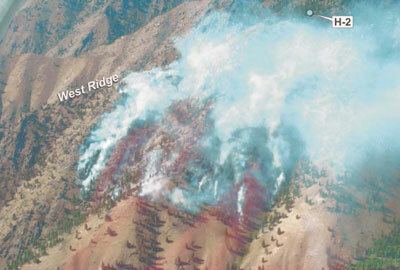 A retardant drop from the previous day, running approximately 100 yards down the West Ridge (toward the west), stopped the fire spread to the north of the West Ridge into the Cache Bar drainage. However, on July 21st, as the fire spread laterally westward below the West Ridge, it burned west of the end of the retardant drop. A small portion of the perimeter then burned over the West Ridge to the north, into the Cache Bar drainage immediately below the West Ridge. 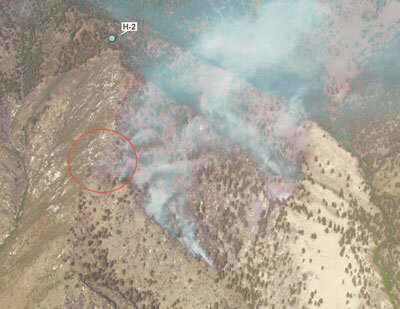 Fire activity was moderate in light fuels, and this slopover was evidenced by light smoke seen in the early evening during a recon flight over the area (figures 20 and 21). At 1952, air attack estimated the fire to be 200 acres (figure 18). After 2000, the fire intensity to the east and northeast began diminishing, and the west side of the fire was reported to have appeared relatively quiet. Figure 18—Cramer Fire late afternoon on July 21, showing typical fire activity for that day. Through the late night and early morning, the fire was again under the influence of a midslope thermal belt. The fire continued to spread by backing (figure 19), rollouts, and short uphill runs. Fire behavior was limited to low- and moderate-intensity surface fire burning through grass and understory litter in open stands of ponderosa pine and Douglas-fir. Figure 19—Cramer Fire early evening on July 21, showing backing and short surface fire runs. On July 22, the fire continued to burn actively until about 0300, when increasing RH caused fire activity to slow substantially. After 0300, the valley inversion in the Salmon River drainage strengthened, and the entire fire area was under the inversion which was at 6500 feet. Fire activity after 0300 consisted of backing and creeping through grass, with scattered smokes in open timber. On the east side, fire intensity was low with flame lengths less than one foot in grass and open pine. There was some fire below H-2 to the east, but it was not very active. The inversion did not begin to break until about 1015. 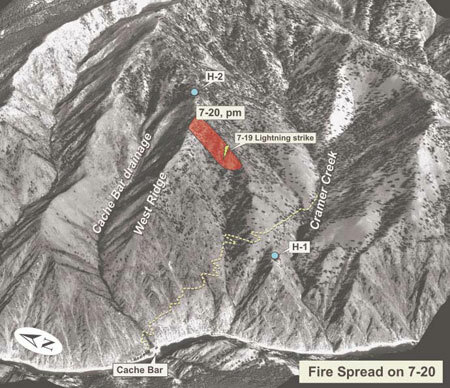 Figure 20—Movement of the fire into the Cache Bar drainage late in the day on July 21. Figure 21—Cramer Fire perimeter and spread on July 21, 2003, and early morning on July 22. No spot forecast was requested for July 22, but the fire weather forecast (zone 405) was discussed at the 0900 morning briefing. During this briefing, fire personnel were informed that conditions had been getting progressively warmer and drier the last few days. Crews on the forest often rely on persistence probability for fire behavior forecasting in the area, using the zone fire weather forecast and the previous days’ weather and fire behavior to predict conditions for the current day. Table 2 shows a comparison of zone fire weather forecast conditions forecast for the afternoon to RAWS observations. Table 2—Zone fire weather forecast comparisons.